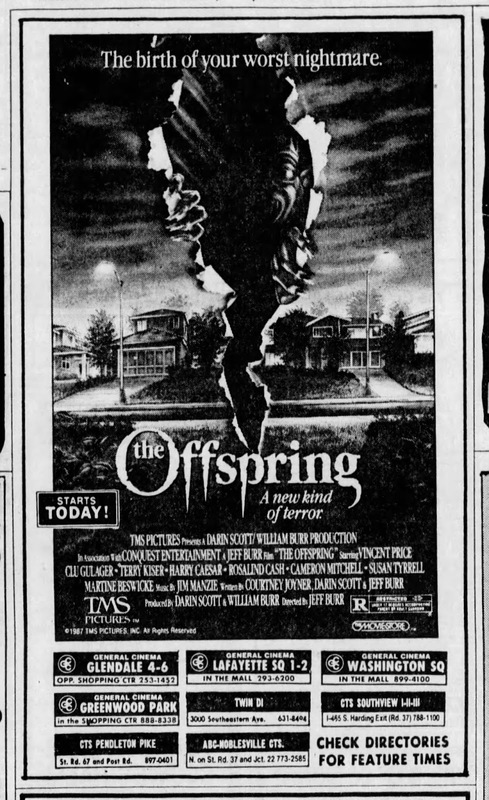 Hard to believe but the classic tales of terror FROM A WHISPER TO A SCREAM (aka THE OFFSPRING) turns 30 years old today. George Romero’s CREEPSHOW aside, SCREAM is for me easily one of the best horror anthologies of the 1980s and perfectly captures that dark EC Comics spirit. It is also another great entry in the long running history of the “little horror indie that could” as it defied the odds to become a cult classic and launched a bunch of careers. 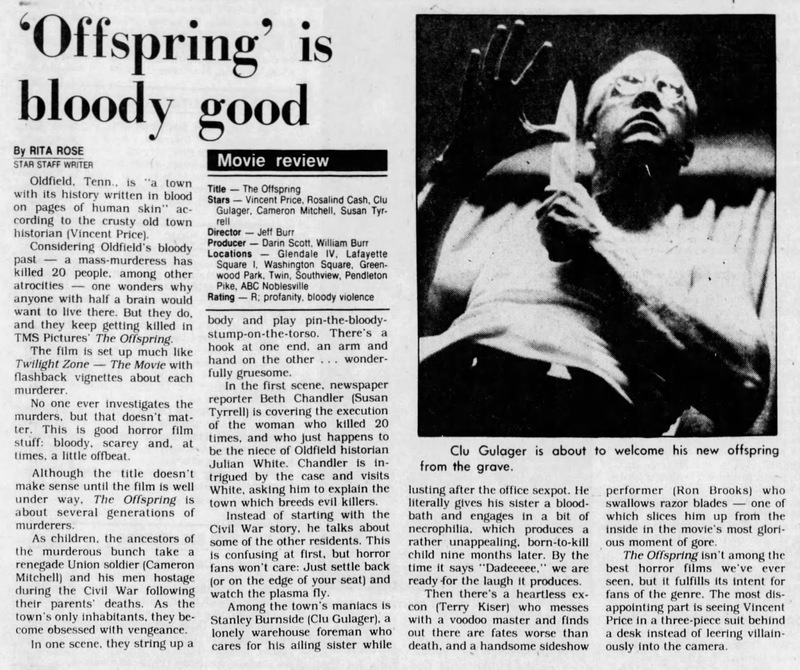 The film was born among a group of USC students (Jeff Burr, C. Courtney Joyner, and Darin Scott) looking to make a horror feature. 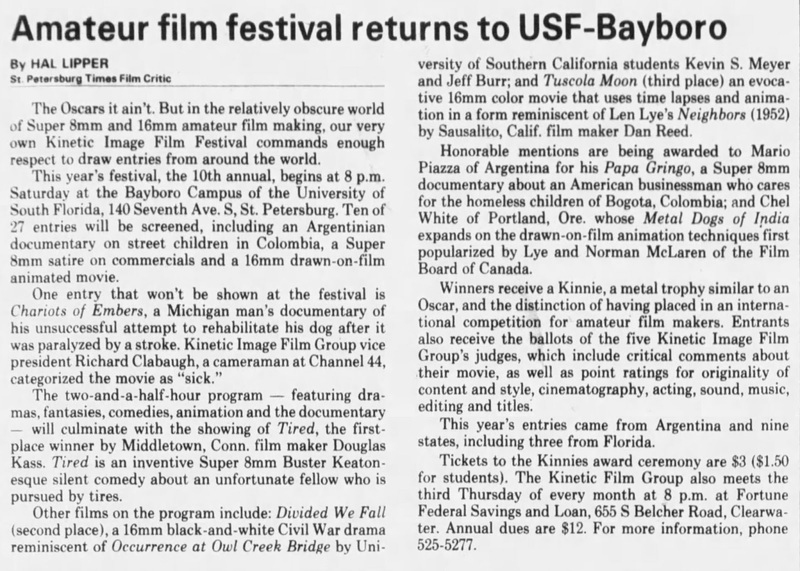 Burr had some early directing experience with DIVIDED WE FALL (1982), a USC project he co-wrote and co-directed that Joyner had also done some work on. 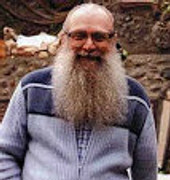 The film even played some festivals throughout the U.S. After this Joyner wrote a vampire script called NIGHTCRAWLERS for Burr to direct (you can read more about that unrealized project here). When that idea fell through, the idea of a horror anthology began to take shape. 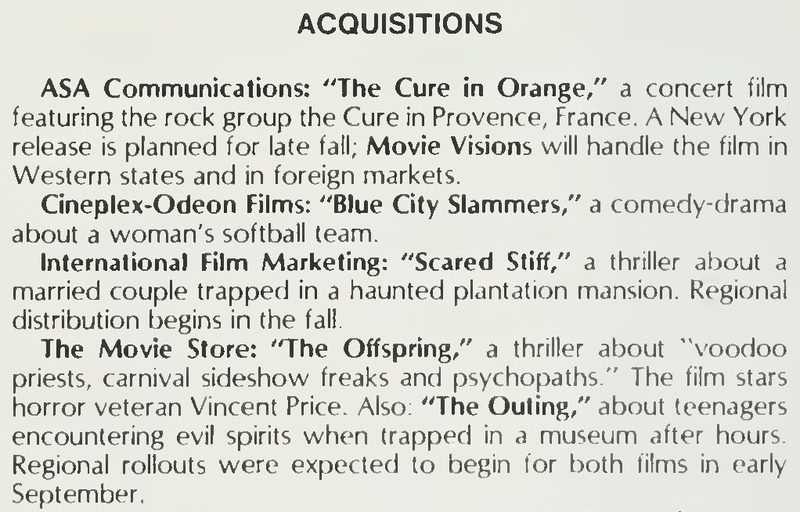 SCREAM has the distinction of being listed in Variety’s “Production Log” twice with two locations all the way across the United States. 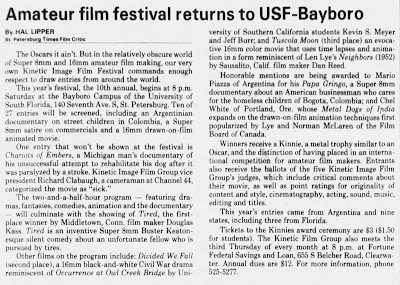 The first mentions were in November 1985 when the film was listed as having shot in Dalton, Georgia with a start date of 8/1/1985. 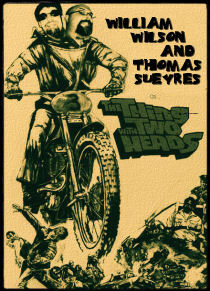 The film popped up in the listings again in April 1986 with Los Angeles listed as the filming location. 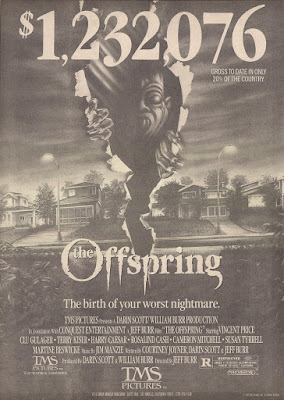 According to what Burr told Fangoria at the time, this happened as they ran out of money during editing. This down period allowed them to raise more financing. It also allowed for SCREAM’s biggest casting coup as they got horror legend Vincent Price to do the wraparound segment opposite Susan Tyrrell (an early Fango report mentioned Carol Kane was considered for this role). 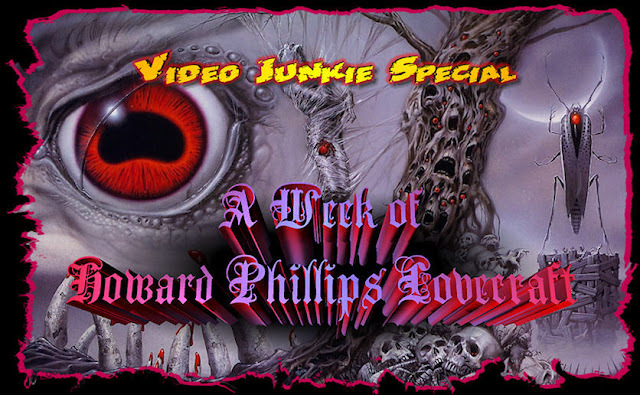 With production wrapped, the film was given a multi-page profile in Fangoria #62, where it was mentioned the filmmakers were hoping to sign with a distributor. 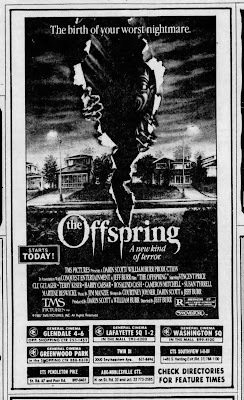 TMS (The Movie Store) Pictures has acquired full North American rights to two full-length feature films, THE OUTING and THE OFFSPRING, and is planning an early September regional rollout for the duo in various markets throughout the U.S. 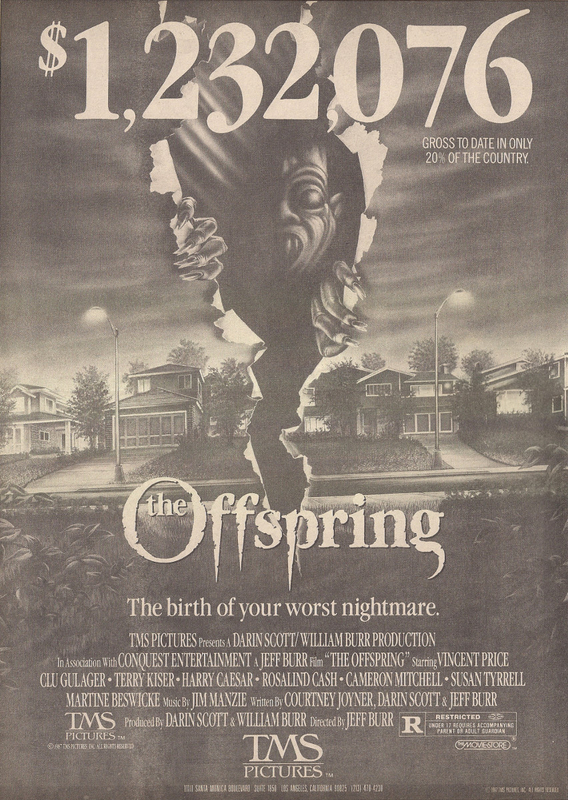 THE OFFSPRING, filmed under the title FROM A WHISPER TO A SCREAM, is produced by Darin Scott and William Burr for Conquest Entertainment. Yes, the film was unceremoniously renamed THE OFFSPRING. While the title certainly fits the film’s town legacy theme, it isn’t quite as evocative as FROM A WHISPER TO A SCREAM. Marquee title changers nationwide, however, loved the title switch. The Movie Store wasted little time getting the film to theaters via their TMS Pictures imprint as it debuted in 55 theaters on September 4, 1987. Locations during this initial rollout included Chicago, Illinois and Indianapolis, Indiana. TMS (The Movie Store) attributes majority of its 300% boost over $2,500,000 generated during the same period last year to tail-end video sales of MEATBALLS III, proceeds from its entire library, and the bulk of box office take from latest theatrical releases THE OUTING and THE OFFSPRING. 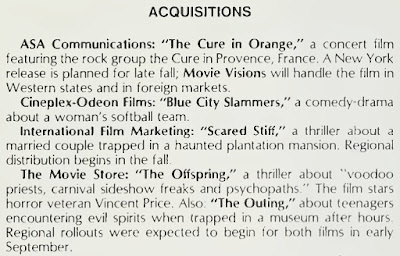 The exec predicted “he expects video sales to exceed 65,000 units when the horror/thriller films go on the market in the second quarter of 1988.” As mentioned in Variety on January 23, 1988, the U.S. home video rights for both films were purchased by IVE (International Video Entertainment). And this is where your humble writer comes in as my own personal relationship with the film started on VHS. My family was living in Munich, Germany and the military base stores used to get everything. As a horror junkie, I already knew about it and was probably thrilled the second I saw it on the new release shelf. I loved every minute of it and took special note of names like Burr, Joyner, and Scott. 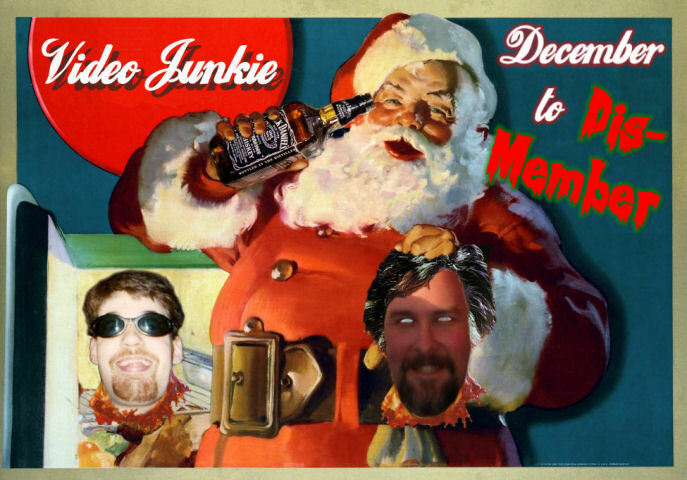 Smart move as the would soon be providing tons of stuff to feed this horror junkie’s habit. 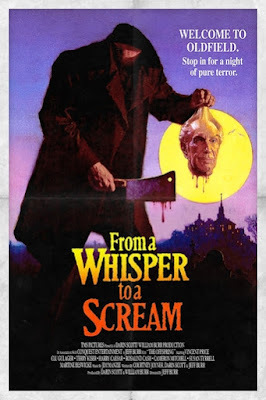 For more on the history of the film, I highly recommend Daniel Griffith’s excellent documentary RETURN TO OLDFIELD on the special edition disc of FROM A WHISPER TO A SCREAM.